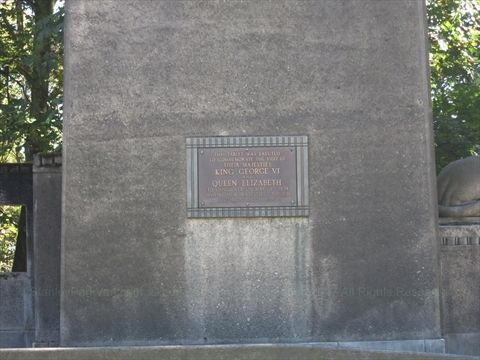 Construction began on March 31, 1937. 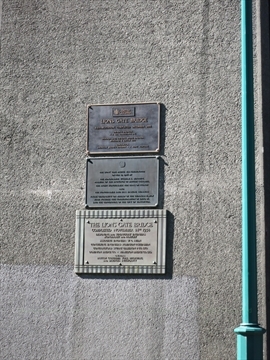 Built by the Guiness Family (of brewing fame) to connect Vancouver with properties they owned in North and West Vancouver. -construction started in March 1937. -A.J. Taylor was the engineer. -built for $6 million originally. -bridge opened on May 29, 1939. -King George VI and Queen Elizabeth officially opened the bridge. -originally was a toll bridge..25cents. -grace maccarthy-lights were a gift from Guinness Family in 1986 and replaced with LED lights in 2009. -bridge deck replaced in...sections lowered to the sea and back at night. -originally a toll bridge, but the toll has long since been removed. -outstanding agreement that when there is a 3rd crossing that cars may be banned from the bridge. -A.J. Taylor's baby shoes are inside one of the lion figures in front of the south end of the brige. Owner's Engineer: N.D. Lea Consultants Inc. Designer and Owners' Bridge Engineer: Buckland & Taylor LTD. The Lion's Gate Bridge was illuminated on Feb 19, 1986 by the honourable William R. Bennett, premier of the Province of British Columbia, the right honourable the Earl of Iveagh and the honourable and Mrs. Erskine Guiness whose generosity on behalf of the Guiness family made possible this commemoration of Expo 86 and the centennial of the City of Vancouver. Contractors: Stuart Cameron & Co. Ltd.
Dominion Bridge Co. - Hamilton Bridge Co. Ltd. 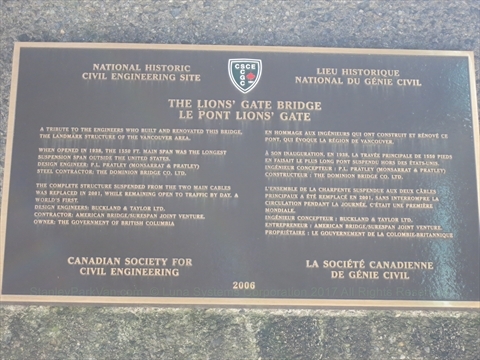 This table was erected to commemorate the visit of their majesties King George VI and Queen Elizabeth to Vancouver on May 29th 1939 when their majesties crossed this Lions Gate Bridge. A tribute to the engineers who built and renovated this bridge, the landmark structure of the Vancouver Area. When opened in 1928, the 1550 ft. main span was the longest suspension span outside the United States. Design engineer: P.L. Pratley (Monsarrat & Pratley), Steel Contractor: The Dominion Bridge Co. Ltd.
Where is Lions Gate Bridge in Stanley Park? 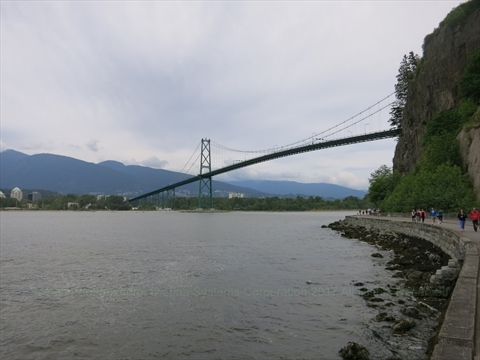 The Lions Gate Bridge connects to Stanley Park on the north side of the park just east of Prospect Point via the Stanley Park Causeway.